A few weeks ago my sister and I were talking about Christmas and I caught myself saying that Christmas day was always a little sad because it meant that Advent was over. While I was talking I realized that what I really love about Christmas is the preparation and anticipation. My father is a pastor so Advent has always been a very prominent season of celebration, complete with a nightly dinner ritual of lighting the Advent wreath. As a child I remember the building excitement as Christmas day came closer and closer, as I grew up, particularly after we moved to the Pacific Northwest, I noticed a shift. My excitement was over cutting down the tree, dancing in the Nutcracker, lunch at Wagner’s Bakery, and seeing Christmas lights. As an adult these preparations are even more important to me, it makes me positively giddy to see our house lit up with twinkling lights, a christmas tree in the window and evergreen garland making the house feel cozy. Alaina thinks I’m a little crazy because I will spontaneously do a happy dance upon walking to the living room with the lit up Christmas tree. Mostly I think it’s the lights, December is so dark, the sun doesn’t come up until 7:30 and by 4:30 its dark again, if it is raining the day is even shorting and sometimes when a winter storm comes through (the rainy, windy kind) it is dark all day. 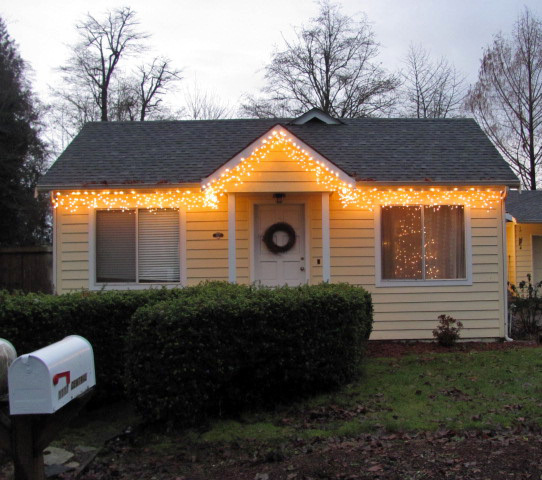 I need the Christmas lights to bring an extra little light to the house. When Alaina and I lived in our apartment we had a porch with wood railings, every year i would make a large evergreen garland and hang it with some lights on the railing, this year I made a smaller garland to hang in the kitchen. I’m not quite done with it, I still need to add some red berries and pine cones, so it looks a little bare at the moment but I love how it fills the space. If you purchase pre-made garland it can be very, very expensive. Making your own is a fun project to spend an hour or two doing. This year we picked a tree that we knew was going to be to tall, then I used the extra branches for the garland along with some other evergreens and greenery I found in our yard and neighborhood. Cut your branches according to the size of the garland you want to make, I’ve found it always turns out bigger then I anticipated, so I think it is safe to cut them smaller than you think you will need. Then you start with one branch for the end and wind a bit of green floral wire (available as a hardware store) around the middle, then you start laying other branches on top, winding the wire around the center branch. 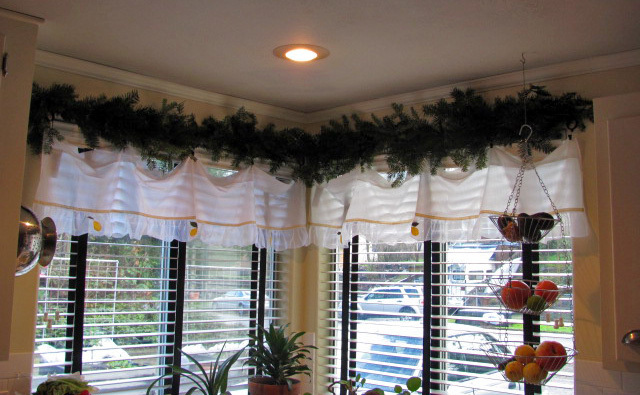 Once the garland has reached your desired length you can finish the end much the way you started. 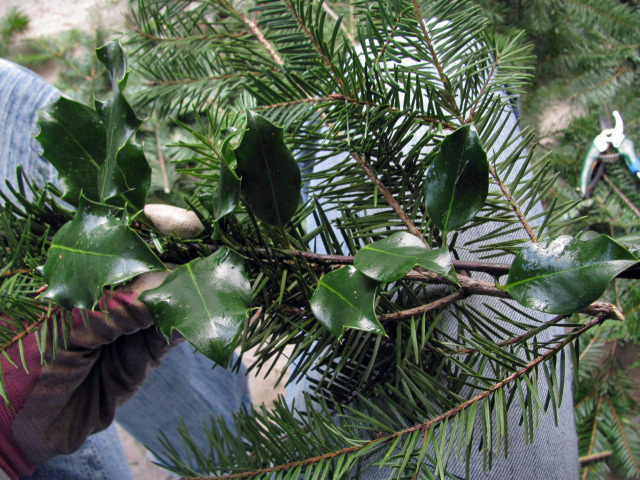 Take a branch an add it so that the cut edge is toward the center of the garland leaving the natural uncut branch on the outside. Wrap the center branch with wire and cut off the extra with enough to secure the end so it won’t come unwound. You can add holly with red berries or pine cones as you make the garland or you can add them after the garland is finished like you would add to a wreath. I’ve been busy making Christmas cookies and working on presents which I will share with you next week, after I get my final projects for school done! This entry was posted in Holiday, Winter and tagged Advent, Holiday, Winter. Bookmark the permalink. Beautiful photos! Wonderful Christmas memories too. And great inspiration for me to try making a garland this week! cute! I love our tree all lit up too!